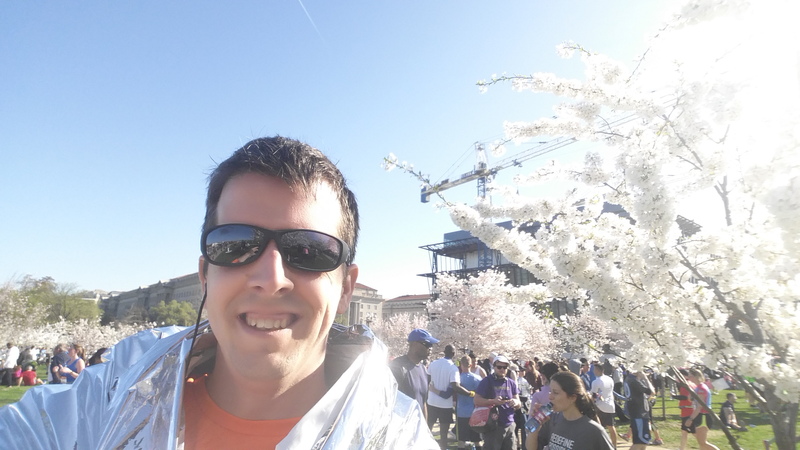 Home › Cherry Blossom Ten Mile › Cherry Blossom 10 miler 2015 – Race Review! 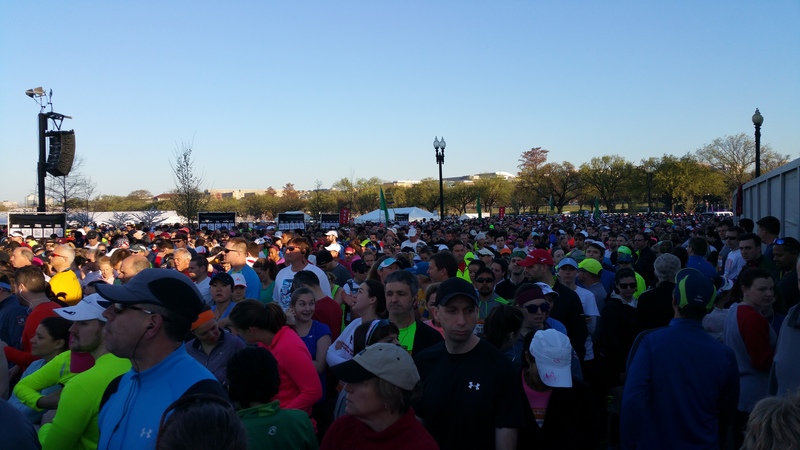 Cherry Blossom 10 miler 2015 – Race Review! 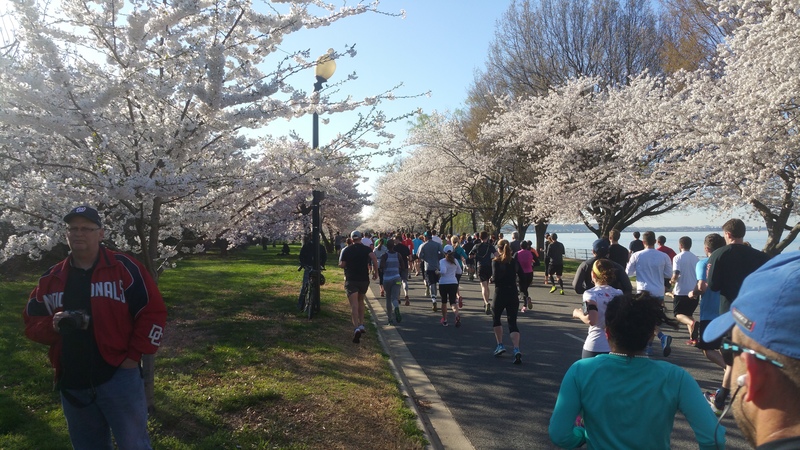 Another Cherry Blossom 10 Miler 9.6 Miler has passed, and it was such a beautiful day!!! I have to admit, that although I have only run this race twice, it is one of my absolute favorite races. 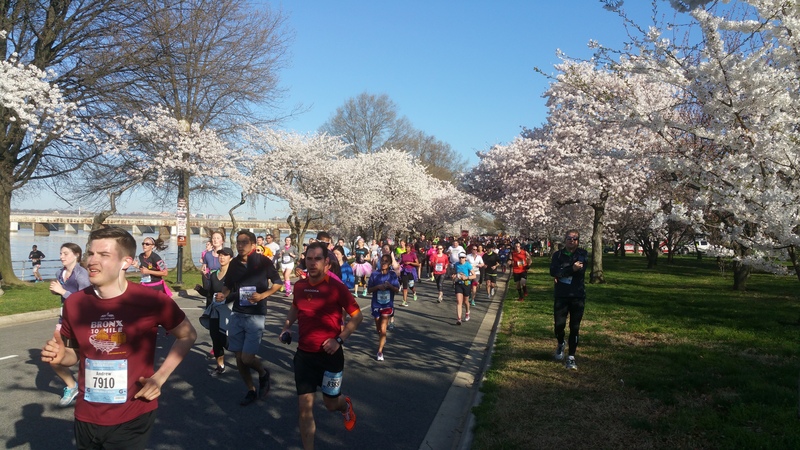 Now it may be due to incredible luck, but for both of the years I have run this race, the weather was great and the blossoms were in perfect bloom! It’s also very convenient to get to, thanks to the wonder that is the DC Metro. If you ever run ANY race in D.C., I strongly recommend using the metro to get there. I also recommend getting on from the end of the line, to ensure you get to sit down, as some races (Marine Corps Marathon for example) quickly become a game of packing sardines into a can! 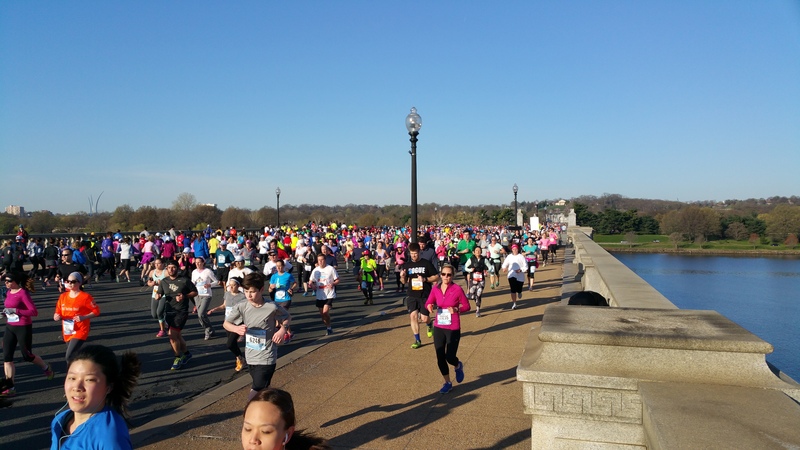 As for those crowds though.. Any race I have run in D.C. (all three of them.. that makes me an expert!) has had over 10,000 runners, which leads to a very cozy start! This race did not look like it was going to be any different. 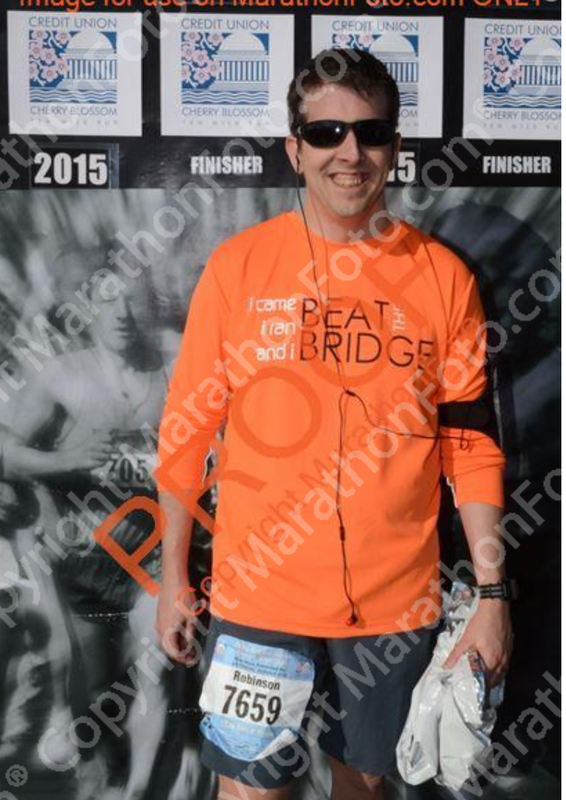 (Sidebar: As we were getting ready for the run, they did let us know that the race would NOT be a full 10 miles. There was a crime scene investigation going on along the course, that caused a re-route and shortening overall.) The race did indeed start, and after waiting for the elites.. then the reds.. then the blues.. then off we went! (I was scheduled for blue, but wasn’t feeling as fast as I had planned back then.) As expected, the crowd was crowded. That kept up for the first couple miles. You know that grassy area between the sidewalk and the road? The one with the ruts, wheel tracks from cars that jumped the curb and the like? That’s where I ran for most of the first two miles. While this was not ideal, it struck me as far better than being inside the pack! The pack started to open up in the second mile, and opened up nicely, well into the third. I actually stopped at the second mile marker and took a picture. If you look at the picture above, on the right sign you can see the back of the “mile 2” sign as a white rectangle! The crowd over all wasn’t bad once it opened up. 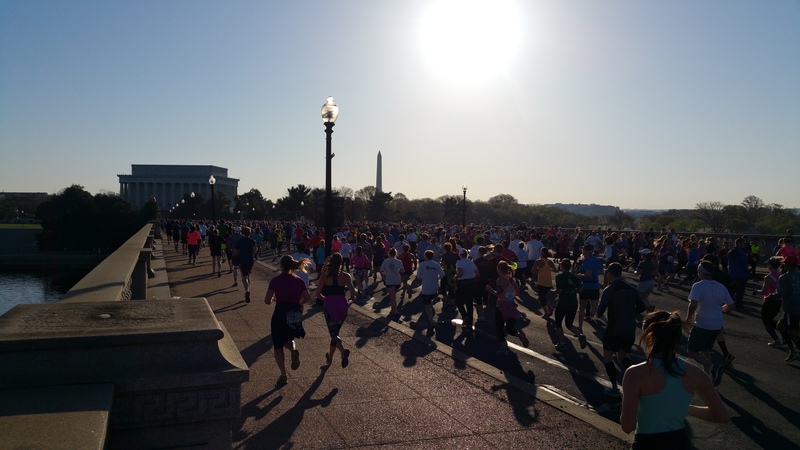 There was a lot less weaving-and-dodging than I remember from 2 years ago… Although its possible that the Marine Corps Marathon just made me better at it. The blossoms were absolutely perfect this year. I want to say that they were at their height, the trees were full – and barely any had started falling yet! Notice the green grass, not a blanket of white blossoms? I have to admit, I was very pleased with how this race went! I felt my hips tightening up at around mile marker 5, and knew I was going to pay for the lack of training. I decided at that point, I was NOT going to slow down, and that I was going to keep my pace for the entire race. (I will admit that at the time, I thought I was lying to myself) As I ran I kept focusing on the progress, and how “little” there was to go. “I’m over halfway, so I can do it..” ? The irony of that last one, is I have never, ever, ever, had any form of a kick.. I have NO idea where that one came from.. Yet, it did.. and, kick it in I did… The last mile or so is primarily up hill with a down hill at the very end. I will admit that on that up hill, with my kick-that-I-don’t-have, I was very happy it was less than 10 miles. Realistically, I think that the extra .5 mile would not have affected my pace – I was very focused on NOT slowing down.. It simply wasn’t an option. I’ve never had that level of will power in a run before, it was an experience. I know understand what is meant when everyone talks about running being more mental than physical. But I promise you, the pain for the rest of the day – AND – the following day? That part is purely physical.. It was sooo worth it though. 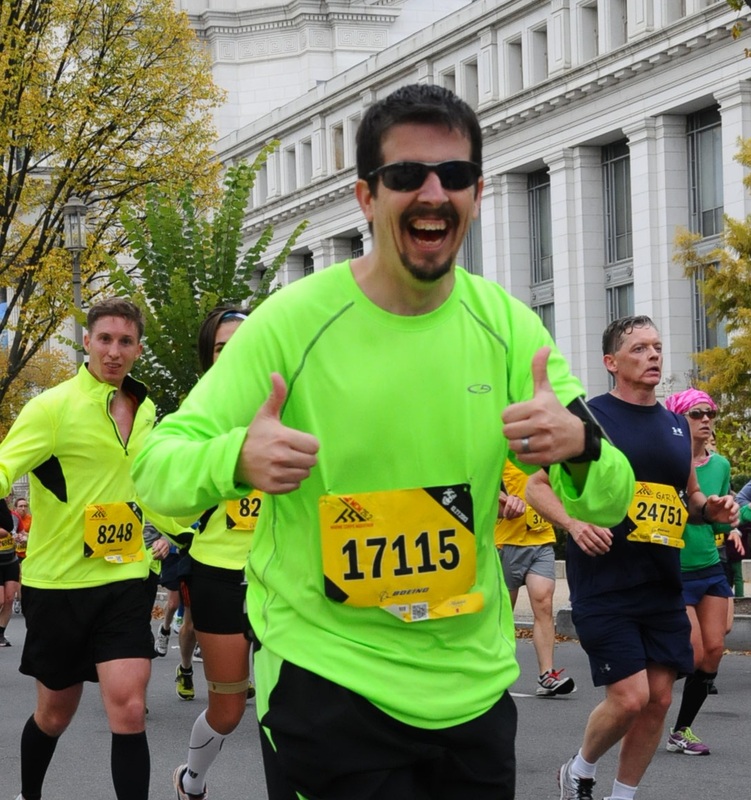 I think Marathonfoto did a much better job than my “selfie.” They must really like me there, as they always seem to get incredibly good shots of me. Scrolling through this years pictures, they again got several in a row that show my full stride.. only this time with me throwing my arms out and acting like a goof ball! I will update my ph without the watermarks, once I purchase them! The run was fantastic. I will continue to sign up for this one every year, as it reminds me its time to start doing something! Since it is so well run, and so beautiful – running it without enough training is STILL a pleasure!!! There are a limited number of slots, so don’t put it off! Tell your friends! Great recap! Congrats on an awesome race. Thank you! it was a fantastic time! I really love this one, and when its peak blossom-time? AMAZING! Loved the recap! Now I understand why the race was short. 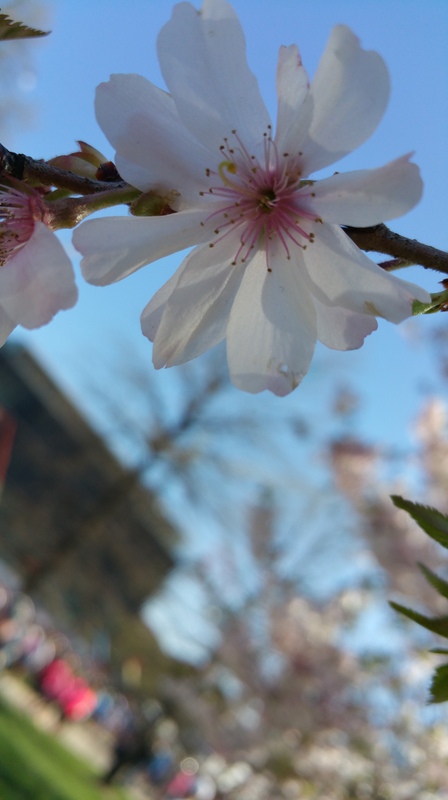 I’m seriously hoping to finally run Cherry Blossom next year. I’ll carpool in with you! I enjoy it, if the gamble of Cherry blossoms works out, there is nothing else like it!